the chieftans, or at least a few of them, played at the "soirees" at zappa's home in february 1993, along with the tuvan throat singers, l. shankar, johnny 'guitar' watson, and terry bozzio. this event is documented in the a&e biography as well as the late show, produced by nigel leigh, bbc2 march 11, 1993.
the music of this original traditional irish folk band is almost entirely instrumental. they were first formed in dublin during 1963, as a semi-professional outfit, from the ranks of the top folk musicians in ireland. the chieftains were a success virtually from the beginning, their music weaving a spell around audiences in ireland and later in england, where they quickly became popular as both a performing and recording act -- the only thing holding them back was the decision by the members to remain a semi-professional, part-time ensemble until the early '70s. their first four albums, spread over a period from 1965 through 1973, were originally available only from the claddagh label in ireland, but were later picked up by island records for release in england and america in 1976, after the group had achieved international renown. the group's big breakthrough in america occurred when they provided the music for stanley kubrick's 1975 movie barry lyndon. the film itself wasn't a hit, but the chieftains were, especially one track called "women of ireland," which began getting played heavily on fm progressive rock stations, and even managed to get onto the playlists of some top 40 stations. 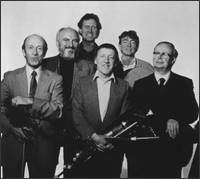 suddenly, the chieftains were hot in america, and a u.s. tour and a series of performances on television -- especially the network morning news/feature shows -- brought them into demand. with their newfound audience, chieftains records started coming out every year instead of every two or three years. ever since the dawn of the cd era, their music has been available on compact disc from the shanachie records, while their more recent work has shown up on the bmg label, on both compact disc and home video. the latter have included a christmas concert and a mixed ensemble performance interweaving the group with orchestras, american folk and country musicians, and rock musicians, and an album (irish heartbeat, 1988) recorded with irish-born r&b shouter van morrison. additionally, the group has been engaged steadily for film work into the 1990s. 'u2 is maybe the most popular and successful musical export coming from ireland today, but there's no comparison between the musical quality of what they do and what the chieftains do. 'we play together here nearly every time they're in town and i love the sounds these guys make. i love the melodies and the chord changes, and especially the way their music is performed. each member of the group is an expert on his instrument, not just in terms of technique, but in terms of the concept they have of what the final ensemble product is supposed to sound like. 'that is something you are only going to get with a group that has been together 30 years. people describe u2 as "post modern rockers", but what does that mean? do they themselves know? and which would you rather have? mediocre invention, or a direct linear descent from celtic culture, which is what i hear in the music of the chieftains? the chieftains are their own culture and i hear traces of not only celtic history but global history in their work, echoing back to the beginning of time. i've noticed that when they play here in my home with ethnic musicians from all over the world. me again: pretty cool, huh? excerpt from "the chieftains the authorized biography"
"in december, while the chieftains were in los angeles on their 13-city us christmas tour, paddy maloney called gail zappa to arrange to see frank. gail told him that zappa was very ill but invited the chieftains over for sunday lunch. "when they arrived maloney commiserated with gail and her two sons dweezil and ahmet and later they all went into frank's studio to record a special tribute which is due out on a future album." spencer, if you are reading this, glatt misspells your name as "chrislau". i had the pleasure of meeting derek bell of the chieftains around a year ago (spring '98) and queried him about the session at frank's home. derek didn't mention the music at all - he did, however, state his admiration of frank and the personal courage he demonstrated during that session. bell said that it was obvious to all that frank was very ill and he felt honored to have been included in the session. in the same respect, i was honored to have had the opportunity to spend a couple of hours in mr. bell's company. i regret i could not have done the same with frank. "a most memorable session with our celtic cousin, mr. tom jones, recorded at the zappa's residence under the bemused and watchful eye of frank himself. in memory of frank zappa"
"track 12: recorded at utility muffin research kitchen, los angeles engineered by spencer chrislu * assisted by dave dondorf"
reading through the page reminded me of an occasion about ten years ago, summer '89 or '90, when i was listening to the "midweek" progamme on bbc radio 4. this was hosted by libby purves and was the sort of show where various guests would come in to be interviewed about their latest book/film/play/record/whatever. much to my surprise, fz was one of the guests and he talked about his involvement with the then new government of czechoslovakia led by vaclav havel, a noted zappa fan. anybody see the chieftains special on a&e last night? it was produced in conjunction with the release of their last cd, "water from the well" ( a great cd, right up there with chieftains 8 and 9 and the one with van morrison on my all-time favorites). anyway, they're talking to paddy maloney and he's answering a question about whether you need to be in ireland to truly get the sound you want for irish music. paddy says no, the chieftains' album "celtic harp" was recorded primarily in frank zappa's basement "when we were there filming something for the bbc with some tibetan (sic) throat singers." he said frank invited them to record something and they ended up recording a good portion of the album there in the basement. from: greg russo's "cosmik debris"
"tennessee waltz"/ "tennessee mazurka" recorded at umrk with uncredited zappa arrangement assistance.